Winnipeg Jets’ coach Paul Maurice said today that the team will be without defenseman Dmitry Kulikov for at least a month with an upper-body injury, according to Winnipeg Sun’s Ken Wiebe. Kulikov went down Friday after being checked hard by Colorado’s Gabriel Bourque. Kulikov, who received a three-year, $13MM deal last summer, hasn’t had a major impact on the team this season as he was only playing in his sixth game of the year Friday, averaging just 10:59 ATOI in those games with one assist. Kulikov has had trouble finding a regular spot in the Jets’ defensive lineup and this injury won’t improve his chances when he eventually returns. With two years remaining on Kulikov’s deal, it already looks like the team made significant mistakes when it locked up both Kulikov and goaltender Steve Mason to free agent contracts in the summer of 2017. Mason has since been traded off (the team had to trade off Joel Armia and two draft picks to do it)and currently is out of the NHL, while Kulikov has dealt with numerous injuries and defensive inconsistencies that saw him get benched during the playoffs a year ago. The team said they will recall a defenseman, but the team may wait until after tonight’s Manitoba Moose’s game tonight. It’s likely the team will promote their top AHL defenseman of the night, which would likely be between Tucker Poolman and Sami Niku. The Colorado Avalanche have re-signed forward Gabriel Bourque to a one-year one-way deal, worth $950K. Bourque was scheduled to become an unrestricted free agent this summer. Bourque, 27, has carved out a nice professional career for himself since being selected 132nd-overall by the Nashville Predators in 2009. 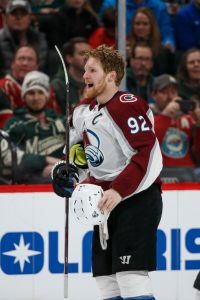 In 306 career NHL games he’s scored just 89 points, but works hard at both ends of the rink and can provide some valuable depth for a team that is suddenly looking more like a contender for next season. After bottoming out in 2016-17, the Avalanche bounced back and made the playoffs on the back of an MVP-caliber season from Nathan MacKinnon and some surprise performances from role players. After re-signing Mark Alt, and Mark Barberio already, Bourque’s contract may indicate the team is now turning their focus on some of the expiring contracts up front. Bourque’s deal poses very little risk as a depth option that could be buried in the minor leagues without causing any cap hit. Matt Nieto (RFA), Nail Yakupov (RFA) and Blake Comeau (UFA) are the other three free agents, though there isn’t a clear picture when they would be re-signed, if at all. In 58 games last season Bourque scored just 11 points, which is likely to be where his totals fall again next year—both in games played and points—if everything goes right for the Avalanche. He’s not being brought back to play in every game, or to be responsible for scoring at a high pace. But the added depth that GM Joe Sakic has integrated over the last year paid off in spades in 2017-18, and he’ll try to do the same once again. After a fleury of goaltending moves in the last few days that saw the team trade for New Jersey goalie Scott Wedgewood and place backup Louis Domingue on waivers, Elite Prospects tweeted that the Arizona Coyotes have called up goaltending prospect Hunter Miska today. Miska, who signed in April this year after dominating year at the University of Minnesota-Duluth in which he took the team to the Frozen Four finals, wasn’t fairing as well with the Tucson Roadrunners, where he had a 4.02 GAA and a .884 save percentage in four games. The call-up suggests that starting goaltender Antti Raanta may not be as healthy as the team thought. Mark Divver of the Providence Journal tweets that the Boston Bruins will recall Providence Bruins’ goaltender Zane McIntyre today as an emergency backup. The 25-year-old AHL goalie has been called up for this reason before, but has not made it into a game yet for the Bruins. He is currently 4-1 with Providence and has played well, with a 1.81 GAA and a .928 save percentage. Divvers adds that he believes it’s due to the fact that Bruins’ starting goalie Tuukka Rask kept getting run into during Saturday’s game against the Los Angeles Kings. The Minnesota Wild announced they have also sent three players down to the Iowa Wild of the AHL, including two former first-round picks, including 2015 first-round pick Joel Eriksson Ek and 2016 first-round pick Luke Kunin as well as Zack Mitchell. No corresponding moves have been made yet. Eriksson-Ek who many believed might have a breakout year has struggled in nine games with the Wild. The 20-year-old center has had just one goal and two assists in that span after putting up better numbers in a 15-games stint with the team last year when he put up three goals and four assists. Eriksson-Ek struggled in the preseason and was a candidate to not make the team at one point, but the team instead sent down Kunin instead. Kunin has been going back and forth between Iowa and Minnesota all year. However, Kunin has been more successful lately as his minutes and numbers have started to increase. The 19-year-old has a goal and two assists that all have come recently, as his short-handed goal against the Islanders Thursday makes him the first player in team history to score his first goal short-handed. Mitchell has also been up and down quite a bit this year, helping out the team’s fourth line while the team deals with multiple injuries. Mitchell has a goal and an assist in five games. Vancouver Canucks’ general manager Jim Benning announced the team has recalled center Jayson Megna today. The 27-year-old returns to the team after having played in 54 games for Vancouver a year ago, tallying four goals and four assists. He has been with the Utica Comets since the start of the season, putting up an assist in four games this year. The move was expected after the team sent Michael Chaput down to Utica on Friday, leaving the team with only 12 healthy forwards. The Colorado Avalanche tweeted that they have assigned forward Andrew Agozzino to the San Antonio Rampage today. He was recalled yesterday for their evening game against the Chicago Blackhawks, but was a healthy scratch. Agozzino has been an offensive force for the Rampage, putting up two goals and six assists in seven games so far this year. He was called up as an emergency forward after the team placed Gabriel Bourque on injured reserve due to an upper body injury. The Colorado Avalanche have signed Duncan Siemens, Felix Girard and Gabriel Bourque to one-year, two-way deals for the 2017-18 season. The team did not release any financial details on the contracts. All three players were restricted free agents this summer, and though Siemens and Bourque were both arbitration eligible neither filed. Siemens is perhaps the most interesting and confounding player of the trio, an 11th-overall selection who has still yet to make an impact at the NHL level. His professional career to this point has been a huge disappointment, but a glimmer of hope yet remains. At the end of last season, Siemens played three games with the club and actually showed he may still have some potential as a Mark Borowiecki-type physical presence on the back end. Though the offensive upside he showed in junior has all but disappeared, the 10 hits he recorded in three games (including six in a single contest) gave fans some hope. Girard and Bourque, both former Nashville Predators prospects came to the Avalanche in the past year to try and take the next step in their careers. Bourque signed with the team last summer on a professional tryout which earned him a contract, while Girard was the return for Cody McLeod in a mid-season trade. At very different points in their careers, Bourque is trying to hold onto the last strings of his NHL career while Girard is just trying to earn a promotion for the first time. Both will see substantial time in the AHL next season. That leaves the Avalanche with three restricted free agents, in three very different circumstances. One, Matt Nieto filed for arbitration and will have a hearing on July 31st should the two sides not find a common ground. Two, Rocco Grimaldi is hoping for a deal to prove that his big time AHL scoring talent can translate to the NHL if given the chance, and three, Nikita Zadorov and a potential long-term deal to keep one of the Ryan O’Reilly trade pieces in Colorado as a young building block. That all comes under the shadow of the KHL for Zadorov though, as rumors have persisted that he has a deal in place with CSKA Moscow should he be unable to reach a contract with Colorado. The Minnesota Wild are finding themselves in a bit of a cap crunch due to a rash of recent injuries, writes Michael Russo of the Star-Tribune. The team is currently without forwards Zac Dalpe and Zach Parise as well as defenseman Marco Scandella, who are all week-to-week. Additionally, wingers Erik Haula (injured, out 7-10 days) and Chris Stewart (sick) were also unable to skate on Monday. As a result of the injuries, the team had just 14 skaters at practice. The team currently has just shy of $1.5MM in cap space according to Cap Friendly but that’s only enough cap space for two recalls. The team could put Scandella on LTIR but that would make it that he’d have to be out for at least 24 days (retroactive to October 27th when he was injured) and if he’s not expected to be out that long, that’s far from an ideal scenario for the Wild. The team could also put Victor Bartley on LTIR but his cap hit doesn’t count in full already as he is currently on season-opening injured reserve (his cap hit only counts for the percentage of time he was on an NHL roster last year) so that wouldn’t free up much more space for Minnesota to work with. Dalpe underwent arthroscopic knee surgery on Monday so he too is a potential LTIR candidate. Suffice it to say, it’s going to be a busy time for GM Chuck Fletcher as he navigates the cap in order to give the Wild a full roster (or as close to one as possible) in advance of their next game on Tuesday against Buffalo. 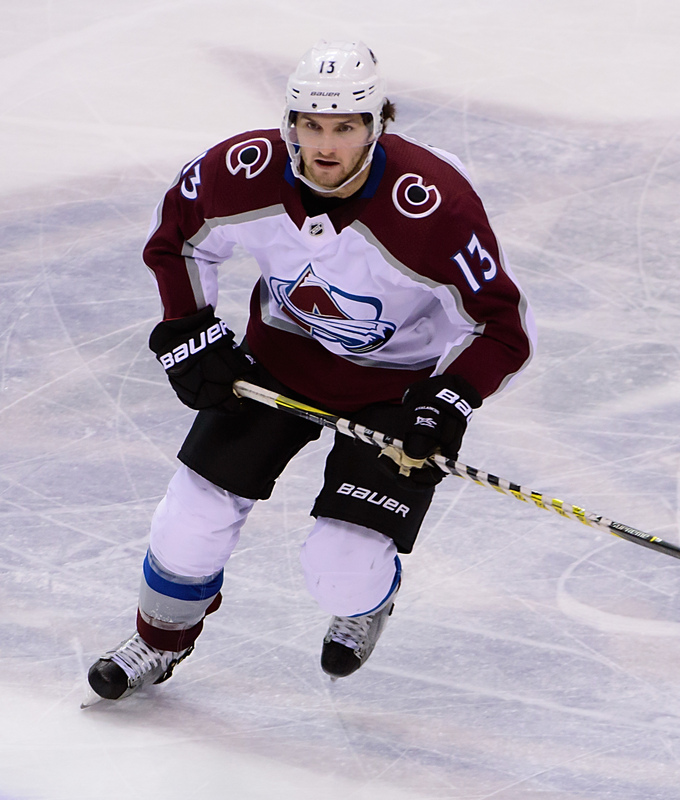 The Avalanche have assigned left winger Gabriel Bourque to San Antonio of the AHL, the team announced (Twitter link). Bourque has played in five games with Colorado so far this season after earning a contract off a PTO, being held pointless while logging 10:46 per game. The 26 year old cleared waivers just prior to the start of the year and since less than 30 days had passed since then, he was able to be sent down now without going back on waivers. The team does not plan to call anyone up to take Bourque’s spot on the roster, adds Mike Chambers of the Denver Post. Dallas center Cody Eakin has done some light skating and head coach Lindy Ruff told reporters including Mark Stepneski of Stars Inside Edge (Twitter link) that he is about 2-3 weeks away from returning. Still with the Stars, Patrick Sharp (concussion-like symptoms) worked out on Sunday. Both of those should come as positive signs considering it was announced earlier today that Ales Hemsky is out for the next 5-6 months after undergoing hip surgery.